The transition from work week to painting week is often difficult for me. I supposedly work only half a day Fridays but it usually turns into a whole day. So last night, to prod the transition along, I took a nice hot shower, put on my jammies and made a cup of Peets Downy Pearls Jasmine Tea. The tea leaves come wound up into cute little balls a bit bigger than capers. 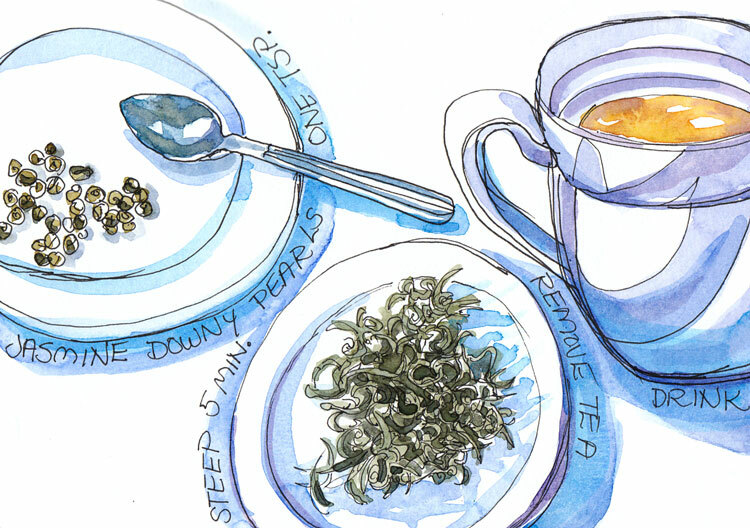 As it steeps, the tea transitions too, from little balls to long spiky, stringy tea leaves that expand tremendously. So I put some dry “pearls” in one plate, the ones that I’d brewed for my tea in another and my tea on the table and sketched and painted it, to reboot and ease into my art life. I just wished I’d drawn with pencil instead of pen since my drawing brain wasn’t really warmed up and ready to go. I know that feeling well! But, I think it turned out great! I agree with Raena! And what a good lesson for all of us, to push through the doldrums of that transition…..or whatever doldrums we have to push through. And I think your sketch is wonderful the way it is! The tea sounds like a good thing…I’ll have to look for that here. I have similar feelings when transitioning from office work to studio work. I remind myself it’s about showing up. Colored pencils and a coloring book is my “I’m too tired to be more organized than this.” response. I prefer the design or pattern collections myself. I’ve also gone back in and doodled/embellished my own print designs and sketches. The idea is to take away as much of the decision making process as possible and get busy. Besides, who doesn’t like to color? Sunday afternoons in a coffee shop with my colored pencils and coloring book are quite nice. Pen or pencil matters not – I like your sketch even with your perceived ink flaws. I too suffer from “work-to-art transition” problems. I like hearing the way you and Gwen approach it. I’ll have to try that. The hardest part about drawing is getting started, isn’t it. This one is really nice – I’m glad you did it in pen, because it’s spontaneous and lively. I’ve been away from my computer too much lately, and I’ve missed exchanging with you!